The group was marching in solidarity with the family of 25-year-old Sandy Michel, who was killed by police in the Algonquin community of Lac-Simon last week. Protesters gathered at the Saint-Laurent metro station around 7 p.m., where speeches were given by indigenous organizers. Shannon Chief, who drove to Montreal to participate in the demonstration, questioned why police in the community felt it was necessary to use deadly force against Michel. The young man was apparently in distress and carrying a sharp object while wandering the community when police arrived on the scene. According to witnesses quoted in media reports, a police vehicle struck Michel, who was then allegedly shot by officers. He was taken to hospital but died as a result of his injuries. Protesters began marching around 7:45 p.m., and headed east down Ste. Catherine St. The group was accompanied by about a half-dozen police officers on bicycles, but no riot police were present as the march proceeded through the streets. 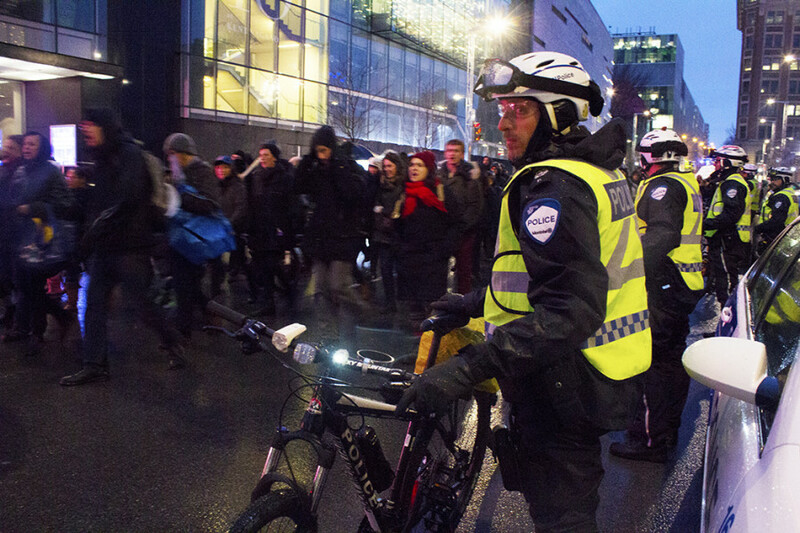 Several anti-police slogans were shouted, including “police everywhere, justice nowhere,” but the demonstration remained peaceful as the group eventually made its way to Papineau metro station. 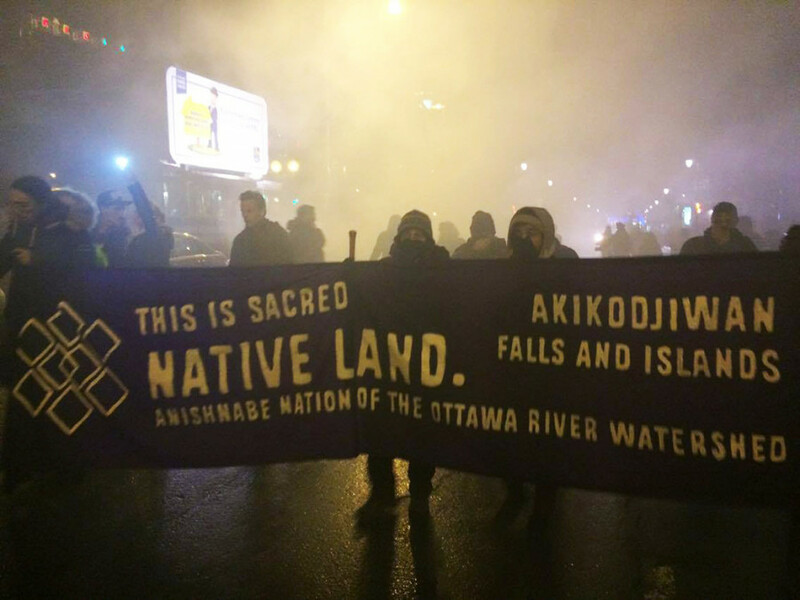 A few minutes later, at roughly 8:25 p.m., two or three protesters with covered faces deployed smoke grenades and began throwing rocks at police on the intersection of Ste. Catherine St. and de Lorimier Ave.
At least one officer was hit, and police stayed back as the march continued. Five minutes later, police made an announcement through speakers that the demonstration was illegal under Montreal’s P-6 municipal bylaw, as no itinerary was provided in advance. Protesters were ordered to disperse. About 20 riot police officers were soon deployed on the ground, smashing their shield with batons and chasing down protesters. One man was seen being violently slammed down to the ground as riot cops ran past him. Police launched tear gas on Parthenais St. as the remaining protesters ran off and dispersed. Speaking to The Link after the march was broken up, Chief expressed disappointment that the evening ended on a violent note. She maintained that the rock-throwers who provoked the riot police response were not connected to the event’s organizers. Chief described them as “two or three white guys with bandanas around their faces,” whom she believed were young people from Montreal. A spokesperson for the Service de police de la Ville de Montréal said there were no arrests made during the protest, and no injuries were reported.